Saputara is a charming hilly retreat which is located at an altitude of approximately 1000 m above sea level. Saputara is located in the Dang district of Gujarat and is situated on a plateau in the Dang forest area. The place is considered to be one of the most well-planned hill station resorts which comprise of waterfalls and viewpoints for sunrise and sunset. To add to the charm and beauty of the place is the river Sarpganga which flows right through the town. The place offers a breathtaking scenic backdrop along with trekking and boating opportunities, which makes it a perfect holiday destination for the nature lovers and adventure seekers. Best Time To Visit: Saputara is a year around destination and offers a pleasant climate throughout the year. By Air: The nearest airport is the Surat Airport which is located at a distance of 172 km from here. The airport is well connected to all the major cities across the country such as Delhi, Bengaluru, Chennai, Hyderabad etc. By Train: Waghai is the nearest railway station, located around 52 km away from here and is connected to the major cities of Gujarat and to a few others outside the state. By Road: One of the best ways to reach Saputara is by road. The town is well connected by roads and there are regular buses which operate from major cities to Saputara. The total driving distance from Mumbai to Saputara is around 248 km. One can reach Saputara from Mumbai by taking one of the routes mentioned below. Route 1: Mumbai - Thane - Igatpuri - Nashik - Dindori - Borgaon - Saputara via NH 160 and Saputara - Nashik Road. If one opts to travel through route 1, one can reach Saputara by driving a distance of 248 km which would take approximately 4 h 43 min from Mumbai. It would take you around 5.5 h to cover a total distance of 326 km via NH 48 and 360, and it should take you around 6 h to cover the total distance of 294 km via NH 48. Nashik is the third largest city in the state of Maharashtra and is well known for its large number of temples which were constructed by different rulers who ruled the region. The Kumbh Mela which occurs once in 12 years is a major event and witnesses one of the largest gatherings in the world. Which happens here apart from other holy towns of Allahabad, Ujjain and Haridwar. The important temples here are Kalaram, Trimbakeshwar and Kapileshwar, which is one of the oldest temples in the region. Pandavleni Caves is another major attraction here, these caves are believed to have been carved about 2000 odd years ago by some Jain Kings. Saputara in translation means the Abode of Serpents and one can find a shrine dedicated to the serpent god on the banks of the Sarpaganga river. There are also quite a few other places which hold significance when it comes to religion such as the Nageshwar Mahadev Temple, the Swaminarayan Temple and a Jain Shrine. The hill station is home to some beautiful gardens like the Step Garden, Rose Garden and the Lake Garden. One can also enjoy a ride in the ropeway here which gives you a bird's eye view of the surroundings. 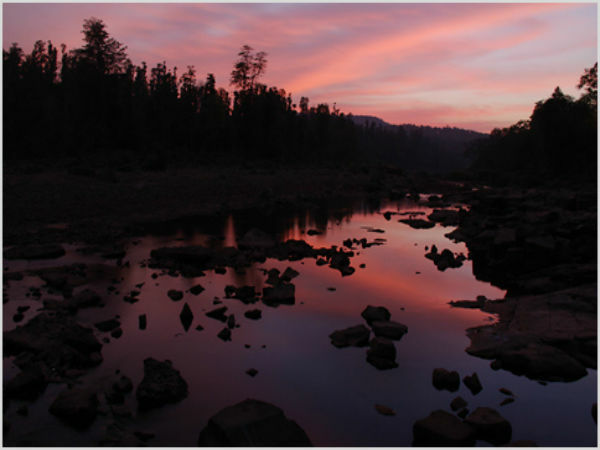 Gandhi Shikar or Sunset Point is a major draw here, the place is a vantage point from where one can get a scenic view of the Dang Forest which is dotted with tribal villages and their settlements. It is also one of the best places to watch the sunset. Situated on the opposite direction of the Sunset Point, one can enjoy the lush greenery along with a brush of the cool breeze and catch the sight of magnificent golden hued sun coming up from here. The Gira Waterfalls originate from the tributary of Kapri and cascades from a height of 30 m into the Ambika river. One of the best times to watch the waterfall is during the monsoon season. This was once a private forest which belonged to Maharaja of Vansda. The national park spreads across an area of 24 sq km. Although small in size, the park is home to a good number of animals starting from leopards, tigers, pythons, etc. One of the best places to capture artists working on Warli paintings in the region is the Artist Village of Saputara. The village not only promotes various tribal art forms but also offers a hands-on experience in various artifacts. It is an ideal place for one to learn and experience the local culture. This fort is located in the Saputara ranges. It was built by Chatrapati Shivaji in the 17th century amidst dense flora and fauna. The fort is now in ruins, but gives you a brilliant view of the surroundings.